Summer is already heating up here in Austin — and that means the age-old dilemma of balancing summer style with “class appropriate” attire. 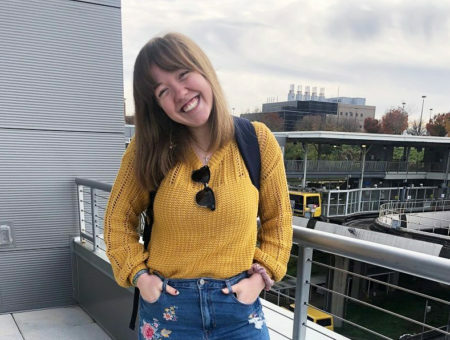 I struggle daily to decide which outfit will best accomodate my schedule of a chilly morning, a cold classroom, a meeting with a professor, a study group for an upcoming test and an afternoon picnic in the hot Texas sun. 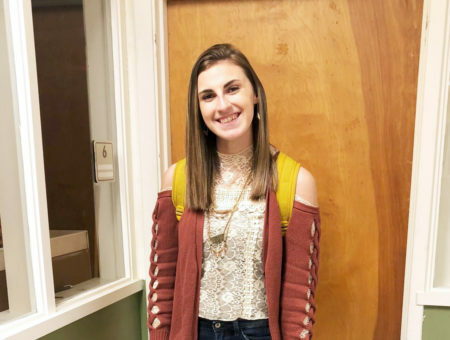 When I saw Augusta walking to class this morning, I knew she had perfected the classy-cool combo so many of us struggle to attain in this limbo between the upcoming swimsuit season and the school semester nearing its end. I knew I had to feature her for Looks on Campus! What are your favorite fashion trends right now? “I really like high-waisted denim cut offs, the bright spring colors (especially turquoise and scarlet) and florals. I love the asymmetrical print of Augusta’s dress; the seemingly random arrangement of the polka dots adds playfulness to the sophisticated cut and color scheme. Also, the pleating adds texture and interest to an otherwise demure dress. I’m a sucker for a cool belt, and this one turns an everyday accessory into an unusual added feature. The Texas toughness in the aged brass buckle reminds me of my brother’s rough riding rodeos, while the sweet floral pattern reminds me of a delicious glass of sweet tea on a hot summer day. 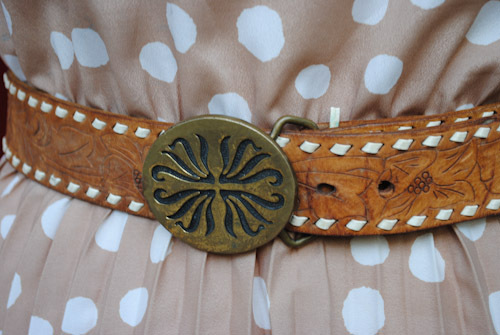 (Okay, maybe that one’s a stretch, but there’s something about this belt that just screams summer!) It’s the perfect width to emphasize a small waist, and it has a uniqueness that separates it from just any run-of-the-mill accessory. Augusta loves pieces with history, and her jewelry absolutely exemplifies this. 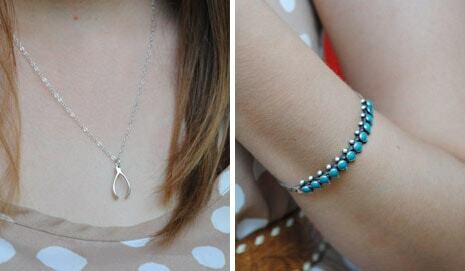 She told me she wears the wishbone every day, and the cuff bracelet is a gift from her best friend’s grandmother. 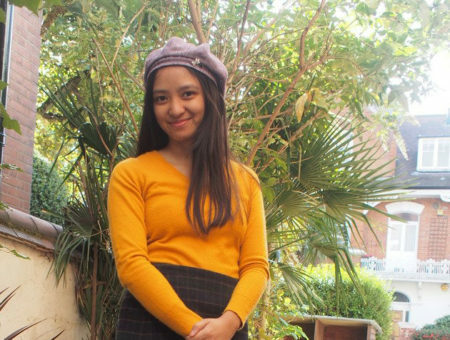 The classic styles of these timeless pieces allow her to mix and match them with all sorts of outfits, keeping close to her the memories of her friends and family wherever she goes. What do you think of Augusta’s style? 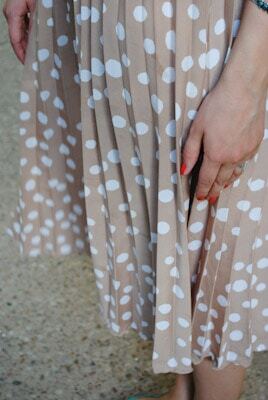 Would you wear her polka dot dress? How do you add unique elements to your outfits? Let us know with a comment!